Omaha Dive Club went to Columbia, MO this past weekend to compete in the Tigertown Challenge. Here they are getting ready to head out to practice bright & early on day 1 before the meet begins. So proud of everyone from ODC... they all did amazing! At the hotel, 6:00 am breakfast call... getting ready to head out to practice before the competition starts. ODC stretching bright & early... too early for me! Warm ups on the 3M... Heath was looking so small out there next to all those big platforms! Setting up for his first warm up dive... front jump straight on the 3M. Preparing for a back jump straight during warm ups on the 3M. Getting ready to practice a front fall in dive on the 3M. Heath & his friend and dive mate Jacob during warm ups on the 3M. Heath's front jump straight on the 3M. Heath's back jump straight on the 3M. Heath's front fall in dive on the 3M. Patiently waiting to be called to the medal stand. Heath was so proud of himself. He ran right over to show me his gold medal... it was unbelievably cute! Heath & Jacob walking back with their golds... Heath in the 7 & under age group, Jacob in the 9 & under age group. Celebrating at the Columbia, MO mall with Jacob by going on a carousel ride! Day 2 of the competition. ODC on the 10M platform... Heath got off of there as quick as he could! Heath's front jump straight on 1M. Heath's back jump straight on the 1M. Heath's front fall in dive on the 1M. Here is a video of Heath receiving his gold medal on the stands... it was so cute, after they got their medals, they all started waving to the crowds. Such cuties... wish I caught more of it on the video! He was so proud of that gold medal... he ran right over again to show me. At 5 years old, he was the youngest diver at the meet! So proud of his accomplishments both days! 9 & Under and 7 & under boys medalists from Omaha Dive Club... all gold and silver! Final medal count... Gold on the 1M and Gold on the 3M and one proud little boy! Back home and ready to take all his medals to school to show all his teachers and classmates! On a winter hike with his brothers. Sometimes he is so tired when he gets home from school. This is where I found him fast asleep after school one day. He must have fallen asleep while on his way to play with Elmo. Too cute! Bowen looking super cute with a toy that he adores! Heath got this toy for Christmas. It is an interactive dinosaur robot. Heath doesn't pay too much attention to it but Bowen absolutely adores it! He loves interacting with it... it is his little pet dinosaur. It's very cute to watch! Here we are waiting to surprise daddy at the airport... too bad we were in the wrong part of the airport! Oh well, at least we tried! Bowen has been doing amazingly good with his eating. He is still feeding himself... as you can see by this pic! His face gets pretty dirty sometimes but it is well worth it to witness the joy he gets from being independent at the table. Another huge milestone he has hit in regards to eating is HE CHEWS NOW!!! He knows how to use his teeth! Finally! This has been a LONG time coming. The fact that he can chew now has opened up a whole new world for us! I just want to take this opportunity to thank everyone for all their prayers regarding Bowen's issues surrounding food. The prayers are being answered and we are so grateful! Bowen REALLY enjoyed daddy's birthday cake! I was cleaning the house and when I came into the family room, I saw Brooks and Bowen cuddling quietly together on the couch. I LOVE this picture. It was such a sweet moment! For Bowen's spring break, I took the boys on a little rode trip to see our good friends in Chicago. We had so much fun! 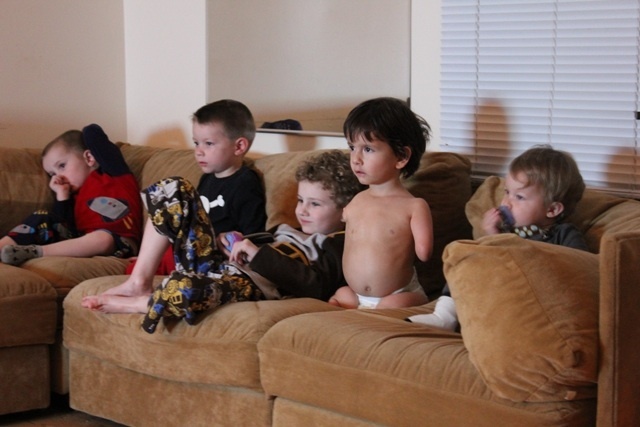 Here they are all hanging out together watching a movie after a long day of playing together. Bowen's tummy cracks me up in the picture. When he is sitting on something that is soft, like a couch, he has to really arch his back for support. You can tell just how much he has to arch it in this picture by looking at just how far his belly is being pushed out! Our friends treated us to Legoland! We all had such a great time. The employees at Legoland in Chicago were wonderful. Bowen never meets the height requirements of rides when we go places. Sometimes we'll ask if they will let him on but I didn't do that here. Then, one of the employees came up to me and asked if Bowen wanted to ride. She had already cleared it with the operator of the ride! How sweet was that?! She didn't have to do that... it really meant a lot. So Bowen rode with my wonderfully awesome friend so I could take pictures. Most of the pics didn't turn out too great but this one did. He was SO excited about being on that ride! I wish I could have captured the look on his face as the ride was going. They really made his day at Legoland... it brought tears to my eyes when I saw just how excited he was as he was going around and around. He just doesn't get to experience that often so it was pretty neat! Playing with the trucks at the Museum of Science and Industry in Chicago... we all had a blast! Bowen and his brothers liked the cow but their friend clearly was not that fond of it! Enjoying the BIG combine at the museum with his brothers. Playing with his brother at our local children's museum. More from the museum. He loved this gravel play area! A couple of weeks ago, Bowen made the big announcement about his name change. If you missed it, it is the blog post made right before this one. Here he is being silly while posing in his new Bowen t-shirt. Someone was Student of the Month at his preschool. How adorable is he?! Bowen has a tendency to overheat very easily so we are trying a buzz cut for the summer to see if it helps a little. He was looking pretty happy with our decision!